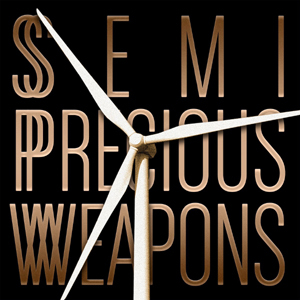 “Aviation High,” the first single off Semi Precious Weapons’ new album, Aviation, is a laid-back jam that lead singer Justin Tranter more whispers than sings, but when the next song, “Look To The Stars,” begins, it nearly blows you off your feet! Aviation is an interesting mix of producer “Tricky” Stewart’s urban pop influences and Semi Precious Weapons’ dance punk sound. They slow things down again with “Never Going Home” and “Healed,” which is especially poignant as Tranter’s voice breaks with emotion. A few songs, such as “Scream to the Sky” and “Young Love,” are big-sounding anthems reminiscent of Thirty Seconds To Mars, while “Cherries On Ice” has a serious hip-hop influence. This fun album will get you dancing and singing along to all the catchy tunes, and don’t worry – you’ll have this one on repeat enough that you’ll learn all the words before you know it!